Centennial and Bishop Gorman won the Class 4A state track and field championships on Saturday at Carson High School. 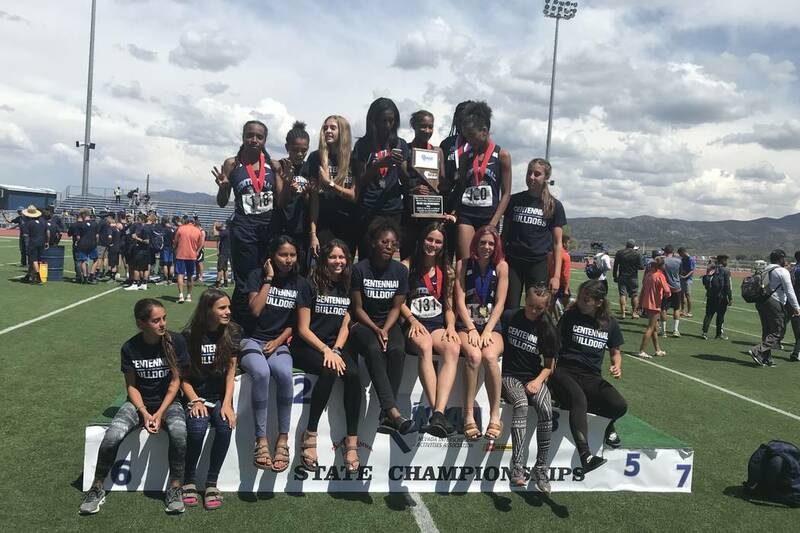 Centennial's girls track and field team poses with the Class 4A state championship trophy at Carson High School on Saturday afternoon. Sam Gordon/Las Vegas Review-Journal. Bishop Gorman's boys track and field team poses with the Class 4A state championship trophy at Carson High School on Saturday afternoon. Sam Gordon/Las Vegas Review-Journal. CARSON CITY — Winning doesn’t get old for Centennial girls track and field coach Roy Session. Not after eighth straight state championships. The Bulldogs scored 103 points to run away with the Class 4A state championship at Carson High School on Saturday afternoon. Sophomore Quincy Bonds won the 300-meter hurdles in 43.5 seconds, and Ashley Moore won the triple jump with a distance of 38 feet, 11¾ inches. The program’s depth did the rest, registering points in 10 other events to beat second-place Rancho by 35. One of the veterans, Alexis Gourrier, ran the 800, 1,600 and 3,200 over the course of the weekend, as well as the 1,600 relay. She said Bulldogs runners known the program’s standard: Train hard and perform as expected. Liberty senior pole vaulter Gabby Carson already has her sights set on another championship. It took all five minutes for her to celebrate her first one. Carson, committed to pole vault at Oklahoma, cleared 13-6 to equal the state record and win her first Class 4A state championship. Carson is already looking forward to competing at Oklahoma, and has some lofty goals to boot. Rancho’s 400 relay team also set a state record, finishing in 45.84 seconds. Jordan Davis, Teleda Williams, Amir’a Edmond and Gizelle Reid set their old mark of 46.07 seconds earlier this year. Other notable local champions from Saturday include Williams in the 100 (11.90), and Liberty’s Aalyiah Soa in the discus (43-4¼). 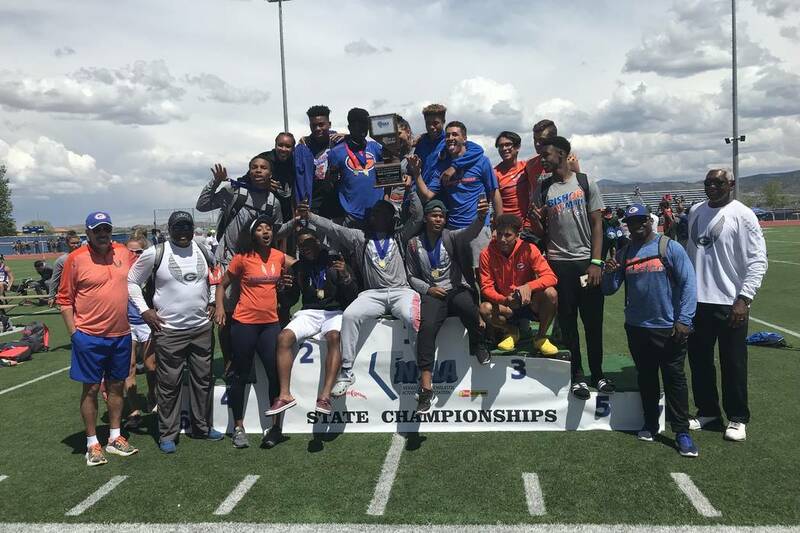 Amid the school’s dozens of state championships in seemingly every sport, Bishop Gorman had never won one in boys track and field. The Gaels scored 113 points to earn the school’s first Class 4A boys track and field championship in its 54-year history. Cooley took over the track program in 2011 and gradually developed yet another champion. Senior sprinter Jalen Nailor helped buoy the Gaels with four state championships — two individual in the 100 and 200, and two with the 400 and 800 relay teams. Junior sprinter/jumper Kyu Kelly also ran the relays and won the long jump with a distance of 22-9. Sophomore Cam Hunterton won the triple jump Friday, and Gorman controlled the standings throughout the course of the two-day event. Centennial senior Tre Harley has multiple state championships in relay races. He finally has an individual title to add to the mantle. Harley won the 400 in 48.16 seconds to clinch his first solo Class 4A state championship. Harley was looking forward to competing with Legacy senior Jeriel Thomas, who had posted the fastest time in the state this season. But Thomas has been battling a nagging hamstring injury for two years, and did not run at state. Other notable local champions from Saturday include Desert Oasis’ Conner Nicholas in the 1,600 (4:32.13), Centennial’s Zaylon Thomas in the high jump (6-5) and Liberty’s Corey Moore Jr. in the discus (189-7).